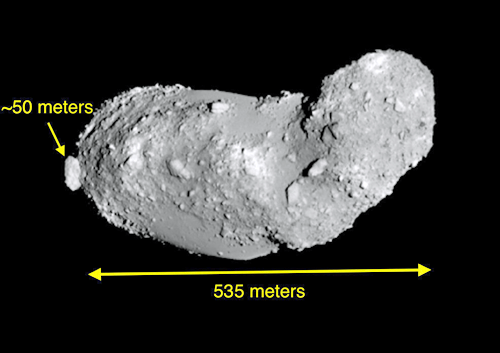 Image of the Itokawa asteroid for approximate visualization of the target asteroid. Image is courtesy of the University of Arizona. The online infosite, Tucson.com, asks the question — What would our government do if a major asteroid was on a collision course with Earth? The NASA Planetary Defense Coordination Office is responsible for organizing a worldwide effort in case of an impact threat. In the past, it has worked with other federal entities in tackling that question during tabletop exercises with hypothetical asteroids. In the face of a doomsday scenario, solutions ranged from deflection of the asteroid to large-city evacuations to disaster relief. But are we really prepared? At one of these tabletop exercises held in January, Vishnu Reddy, assistant professor of planetary science at the University of Arizona’s Lunar and Planetary Laboratory, made a suggestion. “I said, ‘Look, we always play this game of what will happen, but we never do a real-life scenario. How about we take real asteroid and act as if it’s going to hit the Earth and do a live exercise with a real object?’ They went for it. The plan is to exercise the entire system. Reddy will lead the TC4 Campaign, named after the target asteroid 2012 TC4. They will, for the first time, run through the entire observational process of locating an actual near-Earth asteroid, tracking its orbit, analyzing its makeup and planning the response.